Being pregnant at ages 38 and 42, I don’ think that I did my body many favours dishing out calcium to grow the skeletal structures of 2 small humans. For a total of 3 years the mineral generosity was perpetuated through breastfeeding. I don’t know if there’s a connection but I have early osteoporosis and had 3 separate joint issues. For a few years I had temporomandibular joint (TMJ) syndrome, which in layman’s terms is a very sore, frozen, clicky jaw. I could not open my mouth more than about 3cm. Cliff lamented that … actually I won’t go there. A maxillio facial specialist had a bite plate made for me as I clenched my teeth in my sleep. (At that point in my life, I think I can lay that one squarely on my MIL not the little humans). The bite plate helped considerably but I ground it to pieces in under a year. My right hip hurt constantly since my pregnancy with Acacia. I did nothing to treat that and lived with the pain. I suddenly had terrible pain in my index finger. I could not bend it and it hurt like hell. Doctors are my last resort but I went to one because I thought that an insect was stuck in my ear (another story). While at the doc, I asked about my finger and was told that I had (have?) osteoarthritis. 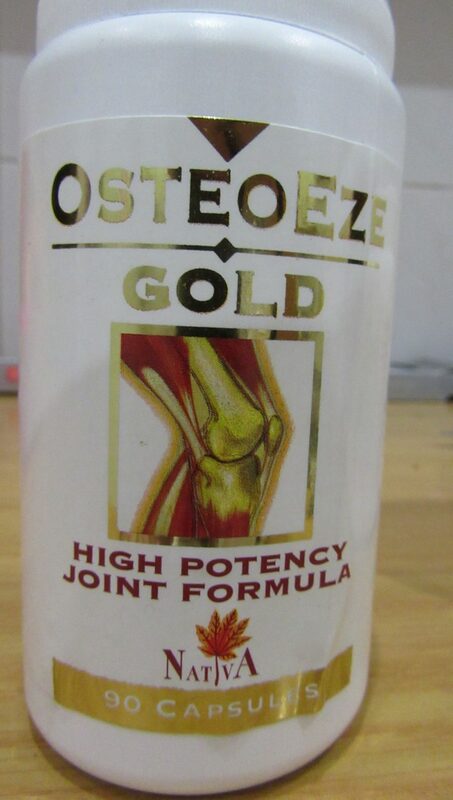 He recommended OsteoEze Gold which a friend had previously recommended for my other aches. 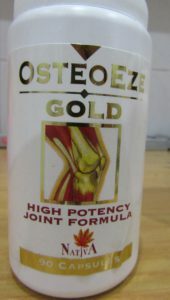 The time had come to fork out the money (it’s not cheap) and try OsteoEze Gold. For the first 2 weeks I took 3 tabs a day, thereafter I cut down to 1 a day. I was gobsmacked. Within 2 weeks the finger and hip pain were gone. Within a month my jaw was dramatically better. The results were extreme. After a few months, I slacked off a bit, when I left it too long the pain began to return. I need to be good and keep at it. It may be expensive but it is so worth taking. Cliff also experienced great results. He will soon write a post for me about his horrible struggle with numb fingers from a bulging disc in his neck. Instead of surgery he took a 4 pronged approach. 1) Chiropractor 2) exercises 3) OsteoEze 4) hot and cold packs. His recovery has been amazing. It is amazing what medicine can do. I remember when Barry first got Arthritis it was awful, then when he went on his medication it made a huge difference. Rather stick to it and don’t miss. Thanks for the advice! I am a bit worried about my calcium intake as well! Thank you for this Sula, I am going to try it. I have just this minute said I only have two pairs of shoes to wear, because high heels or even a slight heel causes hip and severe back pain. I feel like an arthritic 90 year old with neck, arm, finger wrist pains. I have started drinking ginger tea and putting tumeric on my food because going to the doctor means surgery suggestions or antiinflammatories that cause even more problems. I will definitely look into this, natural remedies have made a slight difference. I tried Osteoeze and had mixed feelings about it. I couldn’t say that I had seen a difference, some days pain is mild to nothing, some days really bad. It also has the same effect on my Ulcer/Reflux issue as normal anti-inflammatories so I never bought a new month’s supply and went back to my natural remedies of turmeric etc. Then went to a chiropractor this morning, who highly recommends Osteoeze Gold but said if it causes reflux I must speak to a pharmacist and see if they can recommend a similar product that won’t affect my digestive track. I should also take Vitamin B Complex with Vitamin B12. I also now know why the Osteoeze wouldn’t have made a difference on it’s own. I also don’t want to go that route, Mark had a spinal fusion also with no alternative options. I am confident this woman will sort it out. What she diagnosed from examination then treatment was spot on with the pain I have, so we will see what happens. That must be very disappointing. Did you take the Gold?